The menopausal transition is ridden with a variety of symptoms, from mood swings and vaginal dryness to hot flashes, night sweats, insomnia, and many more. Then, just when a woman thought she's experienced them all, she's struck with sensations of tingling tongue and tingling in the lips. Continue reading to learn more about what causes tingling tongue and tingling lips as well as what you can do to keep this and many more symptoms finally at bay. Why Do I Have a Tingling Tongue and Lips? 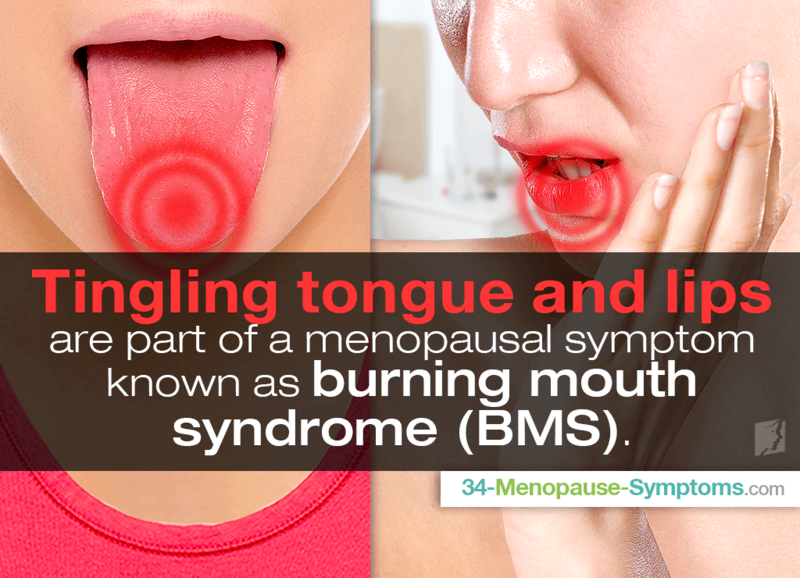 Tingling tongue and tingling lips are part of a menopausal symptom known as burning mouth syndrome (BMS), or simply burning tongue. BMS is characterized by recurrent burning in any part of the mouth without an obvious cause. As such, this syndrome can target the tongue, lips, gums, cheeks, and whole mouth in general. Tingling lips and tongue can appear out of nowhere or gradually worsen with time. The cause of BMS can be either primary or secondary. Primary BMS cannot be traced back to an underlying cause; therefore, it is believed that problems with taste and sensory nerves cause the sensations. On the other hand, secondary BMS is caused by an underlying medical condition. Because the risk of having a tingling tongue and lips is greater in women over the age of 50, it is believed that the hormonal imbalance evoked by the ovaries halting reproductive hormone production is to blame for the occurrence of the symptom. What Can I Do To Treat Them? For secondary BMS that is caused by hormonal fluctuations during the menopause transition, reprieve can be found by implementing several burning tongue treatments. First, relief from tingling lips and tongue can be achieved by using medicated oral rinses or lidocaine, a type of local anesthetic. For more natural measures, search for those with capsaicin, which is a type of pain reliever derived from chili peppers. Also, avoiding triggers of spicy, hot, or acidic foods; alcohol; and tobacco can prevent sudden onsets of BMS. However, most effective relief comes from treating the root cause of hormonal imbalance. Start by optimizing your diet with foods rich in phytoestrogens - soy, lentils, vegetables, fruits, and more - to fill the hormonal gap and taking steps to cope with the ongoing discomfort of tingling lips and tongue. This includes mind-body techniques for stress relief, like yoga and deep breathing exercises, as well as joining a chronic pain support group. Furthermore, combine these efforts with alternative medicines proven to fight menopause symptoms throughout the years. These include phytoestrogenic herbal supplements - black cohosh, red clover, dong quai, etc. - that are more powerful versions of foods with phytoestrogens as well as hormone-regulating supplements, like Macafem. The latter works with your body to encourage endogenous hormone production, thus relieving tingling in the lips and tongue in addition to further maladies. Women suffering from BMS due to other causes should consult with their doctors for best treatment options. While tingling tongue and lips may catch you by surprise, you don't have to let this pesky menopause symptom haunt you for years to come. Take appropriate measures to be rid of the uncomfortable sensations once and for all by using medicated oral rinses in addition to avoiding triggers famous for prompting sudden episodes. For even better results, treat the root cause of hormonal imbalance by optimizing your diet with foods rich in phytoestrogens, partaking in mind-body techniques for stress relief, and using alternative medicines proven to get the job done. With proper vigilance, you can prevent this chronic pain from taking over your life. Numbness or tingling at night has been known to occur in the extremities. Understanding the signs and causes will help you to find faster relief. Tingling Skin: Should I Worry? Tingling skin is usually temporary and not a cause for concern. However, if it persists or is felt with other symptoms, it is best to see a doctor. If you are suffering from tingling in the hands during menopause, it is likely you will have a lot of questions. This article addresses some of the main queries.